The "new" tank now has water, sand and rock so figured I better try to get caught up with a build thread! 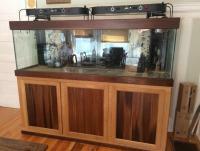 Tank is a Miracles in Glass 125 gallon (6l x 1.5w x 2d) starfire tank (used) with dual internal overflows. 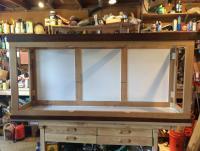 Stand is custom built (by a friend of mine with a little elbow grease by me) of white and burnt oak. 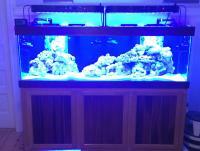 Lighting is a pair of SB reef lights 32 Pro timer units (at 20%white/40% blue in photos). Circulation is by 4 x-wave DC powerheads on two controllers plus rotating returns. Sand is a mix, as is the "live" rock - both from several previous tanks. 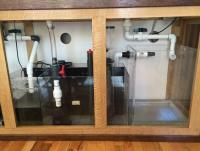 Separate sump and refugium inside the stand - one drain line directly to sump and the other to refugium which then drains into the sump and shares the return setup... single return pump split to the two rotating devices. Skimmer currently an Aquamaxx Cone 2. Aquatronica controller monitoring pH, temp, levels. Calcium reactor and kalkwasser reactor (fed off ATO setup). The reactors are currently in the stand but not yet running. Plans for livestock include a mix of SPS and softies - I have eclectic tastes. As for fish... my wife and I love wrasses so will likely end up with several. Would also like to get a couple small groups of schooling fish this time as the tank dimensions are more amenable - maybe some anthias? 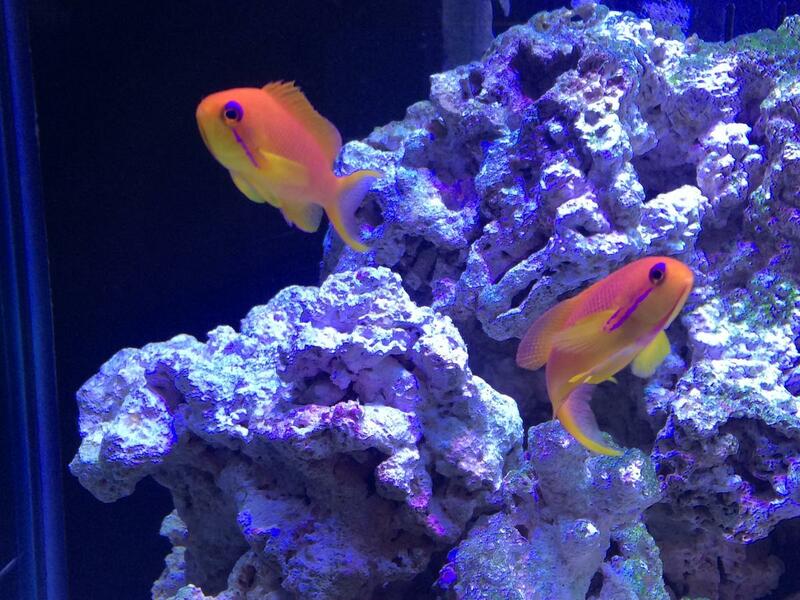 We have had a lot of tangs in the past (scopas, lineatus, kohl) and would consider more (especially a purple). Also had a few reef safe angels and triggers (loved the blue jaw) so perhaps one or two larger fish. Would love to hear peoples ideas! In theory, I would love to make this tank as eco-friendly as possible and focus on locally aquacultured corals from other reefers and stores but know that is hard to do practically speaking. I don't have to have super rare specimens but do love a variety of colors and shapes in the tank. Again, ideas are most welcome. Here are some previews... I don't have picture hosting right now so limited to uploads. 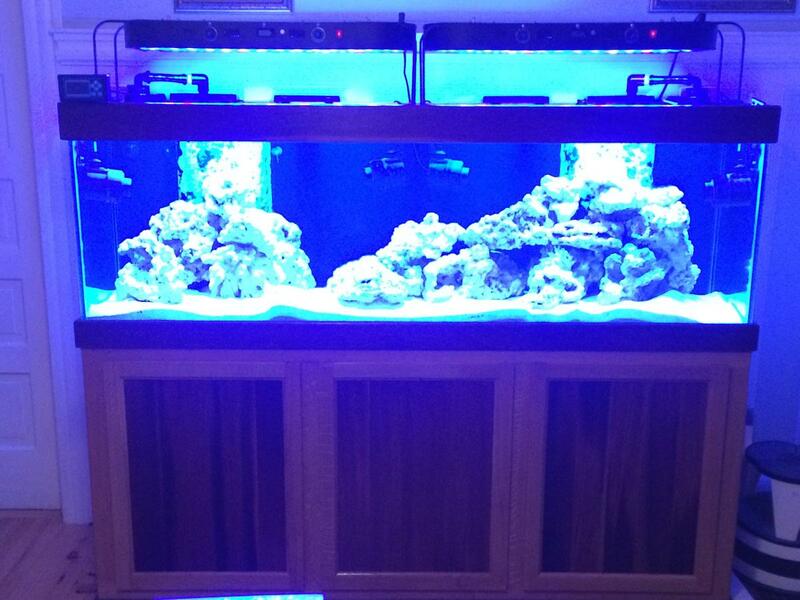 First coral - some zoos that were on the starter rock that Spectra very kindly donated to the build - thanks again Scott! Looks great so far! Once its filled cycled and running good hit me up for some macro I have a few types in my fuge. Nice looking tank and stand. Keep us updated on the progress! Very nice! I love the rock work and the stand. The panels make accessing the equipment much easier ! Great set up! 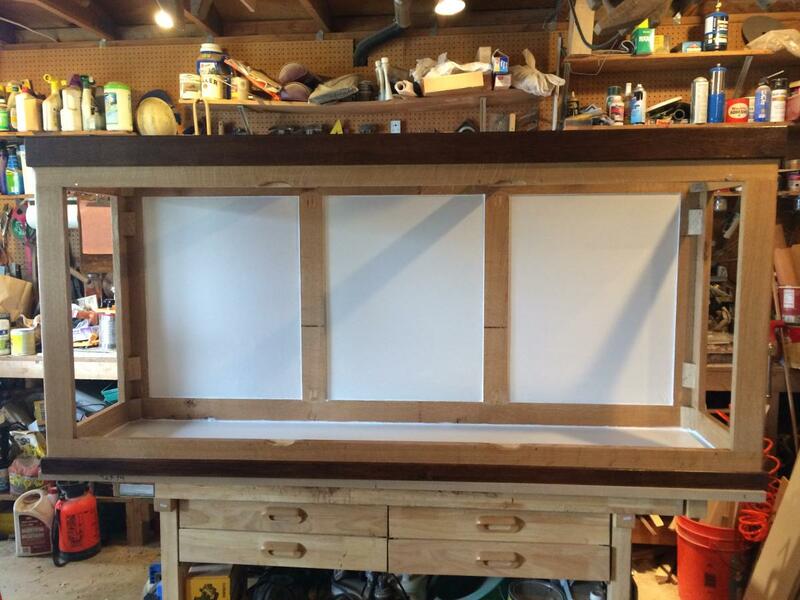 Very clean and organized build. Your anthias are going to be very happy I'm sure. Maybe a club meeting is in your future??? Keep us updated! That stand is beautiful! I also love the matching tank trim. Your sump/fuge came out nice too! Gonna be a beautiful reef for sure! Thanks all! I will try and update as things start rolling. I do want to give a shout out to Scott (Spectra) for the live rock to get things kicked off - I will definitely take you up on the offer of macro in a while. 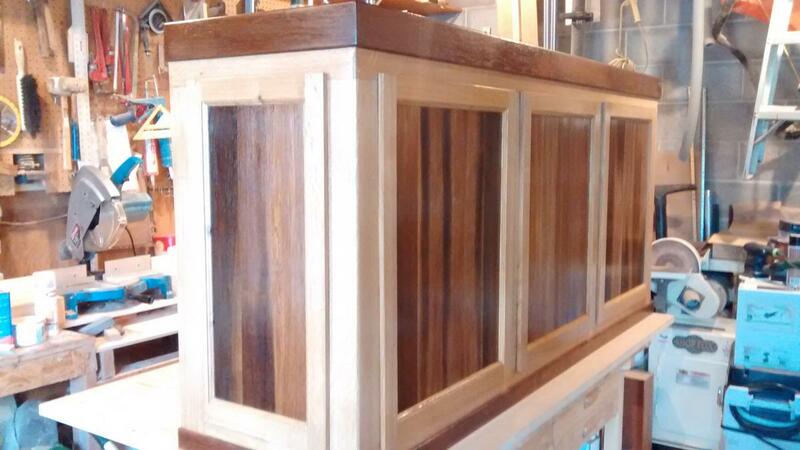 My woodworking friend came up with the scheme for the stand - really happy with the contrasting trim and panels. Still debating the best approach to the fuge.. bare, sand bed, deep sand bed, mud? Will have rock and macro for sure. Updated the post with a couple of pics of the first inhabitants. Been just over a week and so far so good. 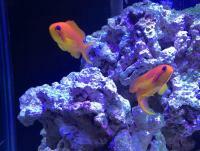 Anthias are enjoying their LRS Reef Frenzy from C&C. Thanks for the recommendation Holly! Really looking nice Sean! That stand is beautiful. I'm excited to see how it progresses! Thanks! I am actually really happy with the way it is looking so am glad I have taken my time with the build. 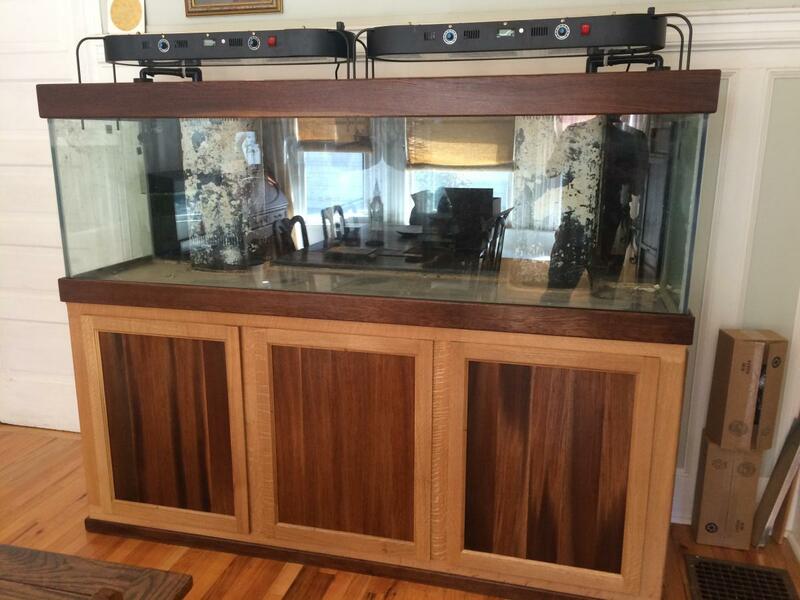 Worked on getting the refugium set up and should have that on line tonight. Will try and get some pics of the final setup. Just a few quick updates..
Woke up to a flooded stand last weekend and discovered that one of the seams on my refugium had sprung a leak. Had to empty that and reseal - testing now. Good news was that my GFI plugs worked, bad news is that the water that made it out of the stand went through the floor into the basement and directly into the cat boxes... insult to injury. Also had the first prolonged power outage in the last 10 years this weekend as we were without from about 11:00 Friday until 9:00 AM Saturday. Got to 55 deg. in the house and 66 deg in the tank before we got it back. Everything seems to have survived OK. Fish stocking is going well. Current inhabitants are 2 orange lyre tail anthias (the first fish), blue star leopard wrasse, male melanarus wrasse, red possum wrasse, green war paint goby, powder brown tang and a orange back fairy wrasse.. Did I mention we like wrasses? So far everyone getting along well although the larger anthias has decided it doesn't really like its tank mate all that much. Woke up to a flooded stand last weekend and discovered that one of the seems on my refugium had sprung a leak. Had to empty that and reseal - testing now. Good news was that my GFI plugs worked, bad news is that the water that made it out of the stand went through the floor into the basement and directly into the cat boxes... insult to injury. Ewww that is not a pleasant image... saltwater and litter box... When stuff like this happens I just remind myself that this hobby is relaxing! Haha... not so relaxing that particular morning I have to admit! The cats weren't all that relaxed either. Thanks joshuapd - been putting a lot of time into it and if finally is looking like a real tank! Sorry to hear about the flooding, Sean. That's my fear, flooding our hardwood floors that are over 100 years old! On the upside, your tank is looking great! Thanks! Yeah, I have nightmares about this very thing. Good news is that the water didn't really collect on the hardwood and just ran down gaps in the subfloor at the wall junction and into the basement - sort of a built in drain (much to the cats' dismay). Our place is from 1909 so over 100 years old but the original floors were fir (still under there). I spent a long time laying the existing 3/4 inch tongue in groove oak so definitely don't want to see it trashed! That is indeed nightmare inducing. Sorry to hear about your troubles Sean. Between the temp swing and the busted seam I would be bummed. I'm glad to hear that nothing died though. Have you introduced coral yet? Thanks Greg. 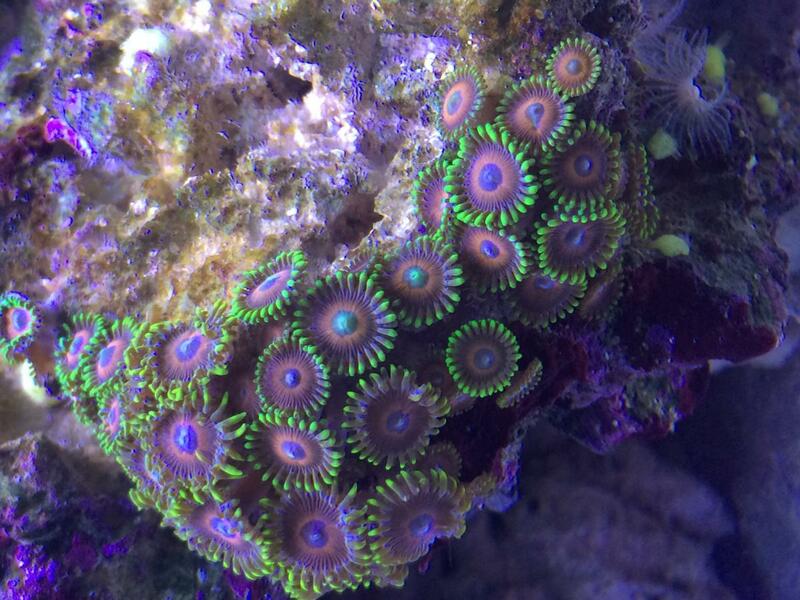 The only coral I have currently is the small colony of Eagle Eye zoas that came on the starter rock I got from Scott. They have been quite happy so far and seem to have weathered the storm (so to speak). I was thinking about testing out a few frags now that the Ca reactor is up and running - levels have been pretty consistent. Current inverts include a cleaner shrimp, a couple of peppermint shrimp, emerald crabs, assorted hermits and snails, a sand-sifting star, a sea cucumber and a brand new clam (thanks again Jeff). I don't have a lot of photo-worthy coral but the collection is mostly SPS including the usual suspects - four different birds nests, several pocillipora, stylos, millis, montis, psamacora, and assorted other acros (Thanks Bert, Andrew, Holly, and Greg, Jeff and Terry). There are a few other odds and ends as well including acans, favia, leptos, chalices (thanks Kim! ), and assorted zoas and mushrooms (thanks Scott!). After several months, things are finally starting to hit a groove and show both growth and some nice color. Keeping my fingers crossed that the trend continues and I will eventually have to start trimming and moving things around to create space (first world coral problems). Looking good! Nice to hear that things are coming along in your operation. Now don't make any direct eye contact with equipment or coral or something is bound to go wrong. At least that's how it seems to go sometimes in this hobby.